Human rights and human dignity are important but also highly contested notions in ethics. This is particularly true in bioethical discourses, where the concepts’ vagueness often precludes focused ethical conclusions. For example, it is a matter of debate “whether there is widespread agreement that all human beings have human rights simply because they are human beings”. Here, it is fair to say that “there is currently no common ground with regard to the moral and legal justification or the ontological and epistemological status of human rights” (Gordon 2013). The situation concerning human dignity is even worse. While the idea of human rights ¾despite the above-mentioned problems¾has become a widespread political and legal issue, the notion of human dignity is instead suffering from severe application problems by virtue of its different meanings (Schroeder 2012, Schroeder 2010) and highly abstract, confusing nature. It is not surprising that the Canadian Supreme Court decided that the notion of human dignity was "confusing and difficult to apply". In this regard, one could reasonably argue that it would be unsound to derive human rights from the shaky grounds of human dignity, because we are simple left with a case of obscurum per obscurius. In his article ‘Human Rights and Human Dignity: A Reply to Doris Schroeder’, Peter Schaber (2013) examines Schroeder’s three main arguments against deriving human rights from human dignity (Schroeder 2012). Her article ‘Human Rights and Human Dignity: An Appeal to Separate the Conjoined Twins’ (2012) was published in a special issue of the journal Ethical Theory and Moral Practice, entitled Human Rights in Bioethics in (Gordon 2012). However, here I intend to show that Schaber’s critique of Schroeder’s view does not provide any serious threat to Schroeder’s main line of reasoning. The first part of this article examines Schaber’s objections and shows why his arguments fail; the second part offers a brief critique of Schaber’s own account of human dignity as “normative authority”. In this response, I shall not attempt to provide my own account of human dignity. Schroeder (2012) distinguishes between religion-based and secular accounts of dignity and notes that religious justification has become problematic in contemporary societies, which have become increasingly secular. If God is no longer acknowledged as a sound basis for human dignity, then one cannot take human dignity as the basis of human rights. In a nutshell, secular societies need convincing secular justifications. Schaber offers three reasons why a religious understanding of human dignity might not undermine the concept’s normative force: First, if the “religious understanding of dignity” is correct, then according to Schaber it would “provide us with the right reasons as to why human beings have certain rights” and thereby establish the “normative work” even if non-believers are unconvinced. Simply put, “the cognitive limits of the non-believers” would be “no reason to reject dignity as a justificatory basis for human rights” (Schaber 2013:2). Secondly, Schaber argues that even if human dignity is justified by virtue of God, it can be the case that the very meaning of human dignity could be framed in “purely secular terms” (Schaber 2013:2). Here, Schaber appeals to Leon Kass (1998), a conservative bioethicist with a strong religious background. Kass claims that “to regard life as sacred means that it should not be opposed, violated, or destroyed, and, positively, that it should be protected, defended, and preserved” (Schaber 2013:2). Third, Schaber states that even if the religious appeal to ground human dignity were insecure, as claimed by Schroeder, it is nonetheless possible that one of the other four non-religious accounts of human dignity that Schroeder mentions might be a good foundation for human rights (Schaber 2013:3). Schaber is correct in claiming that the epistemological limits of the non-believer do not extend to the ontological issue, that is, whether there is a God who has bestowed human beings with human dignity. Of course, it might be the case that the non-believer is wrong and that the true foundation of human rights is in a religious account of human dignity. Of course, neither position can be proven, either by believers or non-believers. In other words, if Schaber wants to derive human rights from the religious account of human dignity, he has to provide a sound and convincing justification for God’s existence, because in this model God himself justifies human dignity. Furthermore, according to my understanding of Schroeder, for her the non-believer who wants to establish meaningful human rights for all may be well advised to avoid reference to religious authority in a world of increasing secularism. Hence, we should return to Schroeder’s pragmatic claim that human rights scholars and activists would be better off justifying their efforts without reference to dignity at all, unless, of course, a secular concept of dignity could be found, which would then carry the burden. Regarding life as “sacred”, and hence claiming that one should protect it from violation or destruction, only makes sense in a religious context. The doctrine of the sacredness of human life is decidedly non-secular. By appealing to Kass, Schaber wants to show that even if the source of human dignity can be found in religion, dignity nonetheless can be framed in a non-religious way that might appeal to non-believers as well. In this respect, Schaber claims that proponents could argue “that human life is sacred due to the fact that human beings are pursuing their own good” (2013:2). This claim is fallacious. The reason why human life is sacred is precisely because God has given human beings dignity, and not because they pursue their own good. To disentangle the meaning of human dignity from its justificatory religious basis is to throw the baby out with the bathwater. Schaber refers to the fact that Schroeder gives five concepts of dignity, yet only one of these is motivated by religion. In this respect, Schaber states that, “If there is a problem with the latter, then those who look for a dignity foundation of human rights could rely on one of the other non-religious understandings of dignity” (Schaber 2013: 3). Yet Schaber does not seem to take into account the essential difference between aspirational and inherent dignity. According to Schroeder, only inherent concepts of dignity can form the foundations of human rights. The four remaining concepts of dignity are Kant’s concept of inherent dignity and three further aspirational concepts. Comportment dignity focuses on society’s expectations of demeanour and bearing, and includes topics as mundane as incontinence at the end of life. Meritorious dignity, which only very few can achieve, subsumes the four cardinal virtues and self-respect. Lastly, the somewhat dated Aristocratic dignity refers to status and honour. It seems crystal clear, therefore, that human rights cannot be based on aspirational dignity. This leaves Kant’s approach to dignity, as discussed in Schroeder’s analysis. Schroeder (2012) argues that one should not rely on Kant’s notion of human dignity because it cannot provide all human beings with human rights. Kant famously argues that only rational beings, who have the capacity for moral self-legislation (i.e. autonomy), have human dignity. Other human beings, for example people in a permanent vegetative state or human beings who, for whatever reason, will never possess the capacity to act autonomously, cannot be granted Kantian dignity without undermining the concept itself. If the foundation of human rights is Kantian human dignity, then such rights cannot be granted to human beings as a species. It may be true that a Kantian justification does not provide all human beings with rights, and this seems to be incompatible with what we find in the official declaration of human rights, namely that certain rights protect all members of the human family (Preamble). This, however, does not seem to be a decisive reason to reject Kant’s concept of dignity. (Schaber 2013: 3). First, Schroeder only claims that through using Kant’s notion of human dignity one cannot ascribe human rights to all human beings. As such, according to Schroeder, one cannot use Kant in order to defend human rights for all human beings. Second, Schroeder applies and defends Kant’s concept of dignity in other articles, (see, for example, Schroeder 2006) and hence Schaber’s rather broad claim is misleading. Furthermore, Schaber seems to suggest that even if “people in a permanent vegetative state should be cared about” they do not have the same “rights which adults have”, so that one could claim that “dignity might be the basis for the rights of those who have the capacity for moral self-legislation, while something else might be the basis of the rights of those who are in a permanent vegetative state” (Schaber 2013:4). This sounds rather like a pick-and-mix strategy for a foundation of human rights, where if one foundation doesn’t fit, one simply chooses another one. As Schroeder convincingly argues in her article, quoting Tiedemann, “The foundation of a concept cannot be dependent on wished-for results. Otherwise one does not provide a foundation, but instead utters more or less concrete … intuitions, whose justification remains open” (Schroeder 2012: 331). In addition, Schaber’s strategy is apparent in another part of the article, where he elaborates on why further work on dignity is needed. He argues that, “one should ask, how dignity must be understood, if it is supposed to give us reasons for assigning to humans the right not be enslaved, the right not be degraded and the right to an adequate standard of living. Is there a way of conceiving of dignity that provides us with reasons for such rights?” (Schaber 2013:5). Taking Schroeder’s starting point¾namely to strengthen human rights advocacy by disassociating human rights from human dignity¾should one really tailor the meaning of dignity in such a way that it could give us reasons for human rights? Schaber himself says that “it might even turn out that no concept of dignity is available which could provide us with such reasons; the concept of dignity would then indeed be useless for the justification of human rights” (Schaber 2013: 5). Schaber argues that Schroeder wants to give up any attempt to derive human rights from human dignity because “dignity can be understood in too many different and incompatible ways to provide us with a foundation for human rights” (Schaber 2013:4). However, this is not what Schroeder has in mind when she tries to disentangle human rights from human dignity. As we have seen, Schaber does not pay proper attention to the essential difference between inherent and aspirational dignity; the latter is unworkable as a foundation for human rights. The former is, in principle, able to justify human rights, but the religious account and Kant’s approach fall short of giving a sound foundation, according to Schroeder. As such, she attempts to show that it makes more sense for human rights scholars and activists to be pragmatic and stay away from dignity, in order to avoid the difficult problems inherent in the concept. Furthermore, Schaber’s argument that the mere existence of “various understandings of dignity” (2013:4) cannot be a good reason to give up on human dignity because many normative and descriptive notions are contested. This, however, is not in disagreement with Schroeder (2012), who writes that “concepts can be clarified significantly”. After defending the idea that human rights can be derived from human dignity, Schaber briefly outlines his own account of human dignity as normative authority, which he thinks is able to withstand Schroeder’s objections. He believes that his notion of human dignity not only informs us about the content of human rights, but also acts as a justification for such rights. His notion is not based on religious beliefs and is, he believes, sufficiently clear; while he admits that his notion of dignity “is not supposed to account for rights which all humans have” (Schaber 2013:7). In particular, Schaber claims that the violation of the normative concept of inherent human dignity is a “severe wrongdoing” that is “related to the moral status of human beings” (2013:5). He assumes that humiliating and degrading treatment is the paradigm example of violation of dignity because it “consists in treating others as if they had no normative authority over themselves and over how they are treated. I think that it is this normative authority which is meant by dignity and which is paradigmatically disrespected by acts of degradation and humiliation” (2013:6). According to Schaber, basic needs and interests are less central to an understanding of human rights than his idea of normative authority. Put simply, “normative authority […] is not simply the capacity to do what one wants, but the right to do so, and so encompasses the right not to be obstructed in one’s actions as carried out within the sphere of one’s authority” (2013:6). Schroeder convincingly claims that “empirical instances of dehumanization” should inform us about the content of human rights (Schroeder 2012:334). In other words, it is not inherent dignity but acts of indignity that can provide content to human rights, in so far as one should avoid these acts and attempt to protect all human beings from such treatment. One major difference between Schroeder and Schaber concerns Schaber’s view that human rights do not, strictly speaking, concern, for example, human beings who are in a “permanent vegetative state” even though they “should be cared about” (Schaber 2013: 4). In this respect, he claims that “dignity might be the basis for the rights of those who have the capacity for moral self-legislation, while something else might be the basis of the rights of those who are in a permanent vegetative state” (Schaber 2013: 4). It seems clear that Schaber wants to follow Kant here. Schroeder, however, has convincingly shown in her article that Kant’s line of reasoning is insufficient for a proper foundation of human rights that accounts for all human beings. For example, human beings with severe mental impairments are certainly not able “to do what one wants with regard to whatever falls within the purview of one’s authority” (Schaber 2013:6) because they simply lack what Schaber calls “normative authority”. That means, in consequence, that also people with severe mental impairments are not protected by human rights, but only “should be cared about” (2013:4). This, however, is in striking contrast to common sense, international human rights law, and the convincing claims brought to the fore by proponents of disability studies such as Quinn and Degener (2002) and Degener (2005). In conclusion, Schaber fails to prove that Schroeder’s objections are misleading. He also fails to offer a convincing account of human dignity that is able to solve the above-mentioned problems. I agree with Schroeder that it would be wise for human rights scholars, and particularly activists, to be pragmatic, and to stay away from dignity as a foundation for human rights. Degener, Th. (2005). Disability Discrimination Law: A Global Comparative Approach.In: A. Lawson & C. Gooding (Eds. 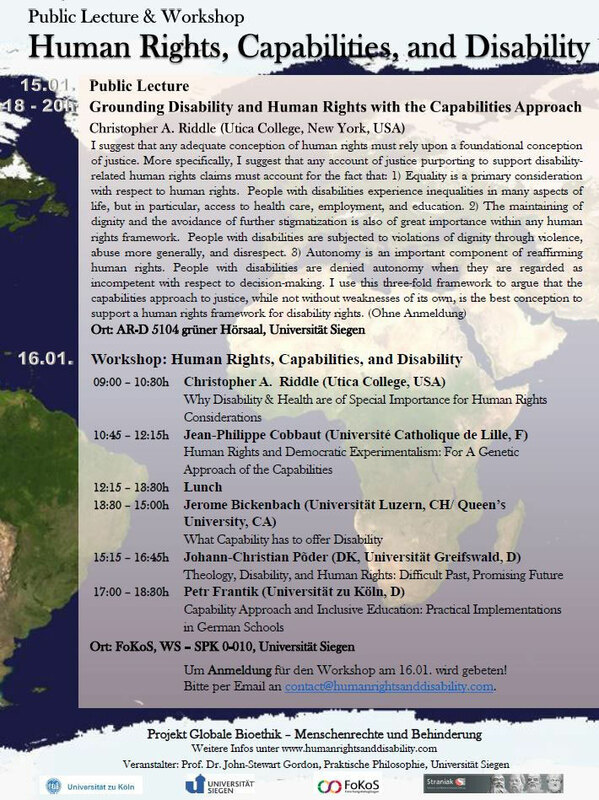 ), Disability Rights in Europe: From Theory to Practice, Oxford and Portland: Hart, 87 – 106. Degener, Th. & Quinn, G. (2006). United Nations Disability Convention. In: G. Albrecht et. al. (Eds. ), Encyclopedia of Disability, Volume IV. Thousand Oaks: Sage, 1580 – 1584. Gordon, J.-S. (2012). Special Issue: Human Rights in Bioethics, Ethical Theory Moral Practice 15(3). Gordon, J.-S., (2013). Human Rights. In: Oxford Bibliographies in Philosophy (Ed. Duncan Pritchard). Kass, L. (1998). Death with Dignity and the Sanctity of Life. In: M. Uhlmann (Ed. ), Last rights? Assisted Suicide and Euthanasia Debated, Washington: Ethics and Public Policy Center, 199–222. Schaber, P. (2013). Human Rights and Human Dignity: A Reply to Doris Schroeder, Ethical Theory Moral Practice, published online: http://link.springer.com/article/10.1007/s10677-013-9427-2. Schroeder D (2010) Dignity—one, two, three, four, five still counting. Cambridge Quarterly Health Care Ethics 19(1):118-125. Schroeder D (2012) Human rights and human dignity: an appeal to separate the conjoined twins. Ethical Theory Moral Practice 15(3):323-335. UN General Assembly (1971). Declaration on the Rights of Mentally Retarded Persons, published online: http://www1.umn.edu/humanrts/instree/t1drmrp.htm. UN General Assembly (1975). Declaration on the Rights of Disabled Persons, published online: http://www1.umn.edu/humanrts/instree/t3drdp.htm. UN General Assembly (1991). Principles for the Protection of Persons with Mental Illness and the Improvement of Mental Health Care, published online: http://www.un.org/documents/ga/res/46/a46r119.htm. United Nations (2008). Convention on the Rights of Persons with Disability, published online: http://www.un.org/disabilities/convention/conventionfull.shtml. equality claimants, rather than the philosophical enhancement it was intended to be”. For example: UN Declaration on the Rights of Mentally Retarded Persons (1971), UN Declaration on the Rights of Disabled Persons (1975), UN Principles for the Protection of Persons with Mental Illness and the Improvement of Mental Health Care (1991), and UN Convention on the Rights of Persons with Disability (2008). LOS ANGELES — Here it comes again: The California Apocalypse. As if motionless freeways, sky-high taxes and calamitous drought weren’t enough, Warner Bros. and its New Line Cinema unit have chosen this worrisome moment to unveil “San Andreas,” the latest cinematic assault on an increasingly fragile California dream. How big is the Big One in “San Andreas”? “Even though it’s happening here in California, you will feel it on the East Coast,” promises a seismic expert, played in the film by Paul Giamatti. We have just seen the Hoover Dam disintegrate in a mere foreshock. Office towers crumble into dust. Yes, that is a tidal wave breaking over the Golden Gate Bridge. No, those aren’t the Mamas and the Papas chanting “California Dreamin’ ” through a trailer for the film: This version, a creepy dirge, is from Robot Koch and Delhia de France, and they’re not yearning to get here. “San Andreas,” an earthquake action-adventure film that opens on Friday, is directed by Brad Peyton (best known for the action-fantasy “Journey 2: The Mysterious Island”) and counts Carlton Cuse (of ABC’s “Lost”) among its writers. Dwayne Johnson stars as a Los Angeles Fire Department rescue chopper pilot on a mission. The film is the latest in a long Hollywood tradition of making the rest of the world feel better by reveling in California’s slide toward its postapocalyptic worst. It’s no accident that Warner’s “San Andreas” trailer features a collapsing “Hollywood” sign: Movieland is often the first to go in these fables. “Audiences get a reflexive thrill in seeing Hollywood — the place that created the movie they’re watching — get decimated,” noted Ken Feil, an Emerson College professor who in 2005 published “Dying for a Laugh: Disaster Movies and the Camp Imagination” (Wesleyan University Press). Mr. Feil was referring to a theory put forth about the disaster genre by Pauline Kael in her review in The New Yorker of “Earthquake,” released by Universal Pictures in 1974. In that film, Charlton Heston jogs by the Hollywood sign as things get rolling, and Geneviève Bujold plays an actress whose workday is ruined by a warning tremor. But Ms. Kael’s dictum might as easily have applied to Paramount’s “The Day of the Locust,” which in 1975 found the beginning of the end in a flaming riot during a premiere at Grauman’s Chinese Theater, or Columbia Pictures’s “This Is the End,” from 2013, in which the world ended, more or less, at James Franco’s house. The urge to level those who live too well, or too wantonly, of course predates film: The Bible gave us Sodom and Gomorrah, inspiration for an Austrian silent blockbuster, “Queen of Sin and the Spectacle of Sodom and Gomorrah,” by the director Michael Curtiz in 1922. Watching seemingly successful people punished by earthquakes, sudden illnesses or bad luck “is literally calming down the people’s anger (that they are less fortunate) and a perverse form of healing the tormented souls,” John-Stewart Gordon, a professor of anthropology and ethics at the University of Cologne in Germany, said in an email. The suffering in Nepal is human; this is cinematic. California’s earliest filmic leveling dates at least to 1906, when primitive newsreel footage captured falling buildings and smoking rubble immediately after the April 18 earthquake in San Francisco, then a gilded capital of sin, known for its Barbary Coast red-light district. “There were ruins on every hand,” read a perhaps gleeful card on one such film, now posted by the Library of Congress. Destruction by earthquake reached feature length in 1936, with Metro-Goldwyn-Mayer’s “San Francisco.” The melodrama starred Clark Gable, Spencer Tracy and Jeanette MacDonald; but the morally tinged destruction of San Francisco’s liquor-soaked hangouts was the sell. “An earthquake, noisy and terrifying and so realistic that the customers will be dodging the falling buildings and mentally hurdling the crevices that yawn in the studio’s streets” awaited viewers, assured Variety in its review. In “Earthquake,” Universal upped the ante with a Sensurround system that emitted low-frequency vibrations meant to make the audience feel as queasy as the people on screen. With computer-generated imagery, “San Andreas” can now rend the earth with startlingly wide fissures, crumple skyscrapers and send Mr. Johnson’s speedboat over that tidal wave in ways that Mark Robson, who directed “Earthquake,” could only imagine. But filmmakers never stopped imagining the end of California, or parts of it, whether by giant ants, as in “Them!” (1954); pod people, as in “Invasion of the Body Snatchers” (1956); birds, as in “The Birds” (1963); or Japanese bombardment, plus John Belushi, as in “1941” (1979). There were more earthquakes, as in “Short Cuts” (1993) and “Escape From L.A.” (1996); a volcano, triggered by ill-advised subway construction, in “Volcano” (1997); falling frogs in “Magnolia” (1999); and armed aliens in “Battle: Los Angeles” (shot in Louisiana in 2009, and released in 2011). In “Miracle Mile,” an indie thriller written and directed by Steve De Jarnatt in 1988, it rained nuclear bombs on a date gone wrong between Mare Winningham and Anthony Edwards. Ground zero was the mid-Wilshire tower in the Miracle Mile district of Los Angeles that now houses The New York Times bureau: For those who live here, it gets personal. (New York has suffered its share of movie damage, though it is usually not seismic. Apes and meteors often play a role, as in “King Kong,” from 1933, or “Armageddon” and “Deep Impact” (both from 1998). More than a few of the California films settled scores with a place that seemed to have it too good. In “San Andreas,” overcompensated Northern California techies get their comeuppance as tsunami-tossed ships, trolleys and office furniture crash through some of the most expensive real estate on the planet. Salvation is low-tech: It comes in the form of land lines, hot-wired cars and raw nerve. Others might say Californians have done enough damage here, without Hollywood’s help. Chuck DeVore, a former California Republican state assemblyman who is now vice president for policy at the Texas Public Policy Foundation, lists prohibitive housing costs, rising taxes and overbearing bureaucracy as contributors, in his view, to a paradise almost lost. “If I didn’t think so, I guess I wouldn’t be in Texas,” he said. A version of this article appears in print on May 26, 2015, on page C1 of the New York edition with the headline: California Is Calamity Magnet on Screen.